NEW YORK — Much of the New York City neighborhood selected by Amazon for one of its new headquarters is in a federal “opportunity zone,” a designation created by President Donald Trump’s tax overhaul that offers developers potentially millions of dollars in capital gains tax breaks to invest in high-poverty, low-income areas. 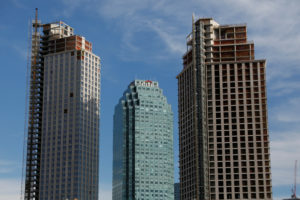 Critics question whether Long Island City, the fast-gentrifying Queens neighborhood across the East River from the skyscrapers of midtown Manhattan, needs such breaks. Median household income around Amazon’s planned campus is $130,000 a year, poverty is half the city average and new buildings were going up long before the tax overhaul. Under the new tax law, officials in each state designated 8,700 such zones across the country. Nearly 35 million Americans live in such areas, communities that in most cases have higher poverty and unemployment rates than other U.S. communities or contain or are near pockets in desperate need of development. The state choices were only finalized after approval by Treasury Department officials in July. The site of Amazon’s other new headquarters in Crystal City, Virginia, was not in an opportunity zone, nor was the site of another major Amazon office in Nashville, Tennessee, that was also announced Tuesday. Amazon did not mention the Long Island City opportunity zone tax breaks Tuesday in any of its announcements about the new campus. Company spokesman Adam Sedo declined to provide details about whether Amazon plans to take advantage of them. But investors were already pouncing. Craig Bernstein, founder of the investment fund OPZ Capital, said the capital gains break is good public policy because it helps push investors to put up the money for new housing, which may be in high demand once Amazon fills an expected 25,000 new jobs in the neighborhood. “This will help expedite the process of building up the surrounding area,” Bernstein said. Bernstein said his fund is looking at investing in two buildings near the Amazon site to develop into mixed retail-residential space. With Amazon moving in, he said, he sees another reason to take a risk: A “captive audience” of workers looking for apartments and shops. Separately, Amazon is tapping New York state for grants and tax breaks worth more than $1.5 billion, the richest in state history and more than triple those offered by Virginia. Investors who plow capital gains into Opportunity Zone projects can defer taxes on those gains up to 2026. If they decide not to cash out on their investment for up to seven years, they receive another benefit: They get to exclude up to 15 percent of those gains from taxes. And they can completely exclude paying taxes on any further appreciation of those gains if they hold onto the investment for a decade. Capital gains taxes can be as high as 23.8 percent. Amazon is tapping New York state for grants and tax breaks worth more than $1.5 billion. Critics worry that such sweetheart tax savings would benefit real estate interests aiming to direct investment into areas that are not truly disadvantaged, but instead are already bolstered by neighborhood gentrification or because of their proximity to expanding institutions such as hospitals, colleges or other facilities. “These zones incentivize corporations that don’t need the support,” said Barry Lynn, executive director of the Open Markets Institute, a think tank critical of financial inequality and corporate monopoly. The Treasury Department did not immediately respond to a request for comment. Long Island City was quickly gentrifying before the new tax law. Since 2010, more than 9,000 apartments and homes have been built, a construction boom that makes the neighborhood the fastest growing in the city, according to the city Planning Department. Thousands more units are planned. Despite the new supply, prices are high. In the past year, two-bedroom apartments off the Anable Basin where Amazon would move have rented for an average $4,300 a month, according to brokerage site Streeteasy. That puts it on par with rent in some buildings on the Upper East Side across the East River in Manhattan. The census tract where Amazon is moving has a poverty rate of 10 percent, half that for all of New York City, and the household income of $130,000 a year is double the city median. That makes the area too wealthy to qualify for tax breaks on its own, but the tax law allows such areas to piggyback on nearby ones that do qualify. For example, Amazon’s Anable Basin site is just a mile from the census tract containing Queensbridge Houses, the nation’s largest public housing complex, where the median household income is $14,000 and the poverty rate is nearly 50 percent. Stephen Braun reported from Washington.